Setting up your social media feeds is an important and ridiculously exciting (just us?) rite of passage in starting a business these days. And in the case of Instagram there are a surprising amount of decisions to be made, not least how you want your grid to look and feel. The goal is to be consistent with your branding*, making you distinctive and recognisable. But if you’re anything like us you already lust after so many different Insta feeds it’s hard to know which way to go with it, leaving you in danger of posting a jumble of different images that just don’t gel together. Julia is a photographer so you may think, “It’s easy for her!” But don’t let that put you off. We can learn loads in terms of design from her natural, muted colour palette and clean, uncomplicated images. We picked this post in particular to demonstrate how effective a simple flat lay can be. This one uses natural materials you could find around your garden paired with minimalist text in a gorgeous hand-penned font. The overall effect is an uncomplicated image that, when you break it down, is a lot simpler to create than it looks. TIP: It’s important to get the lighting right when creating a flat lay as awkward shadows are a definite spoiler. Soft, natural lighting is best. Another photographer, but a very different style. While if you look at Suzi’s grid you’re presented with beautiful portraits, she’s not afraid to break these up with inspirational quotes or amusing comments to add interest and reach out to new audiences. Posts such as this one are carefully designed in Suzi’s brand colours and fonts – peaches and greys, so they create a coherent feed overall. This image is also credited to her so that if it’s shared it will be attributed back to her. TIP: Save time by setting up a template in Canva, or a similar user-friendly graphic design package, so you can create on brand #Instaquotes quickly and easily. We love this post from Amazing Grains as it demonstrates how to use brand photography effectively. This healthy home-baking company show off their delicious products regularly using lovely, professional brand photos of their delicious grains being used. Including an offer on the image makes it feel current and attracts attention with a splash of on-brand colour, creating enough intrigue to encourage viewers to read the text below the post. TIP: Pulling out brand colours to use in text boxes on images will create a consistency across your feed and help strengthen your branding overall. PS: We created the packaging in this photo! 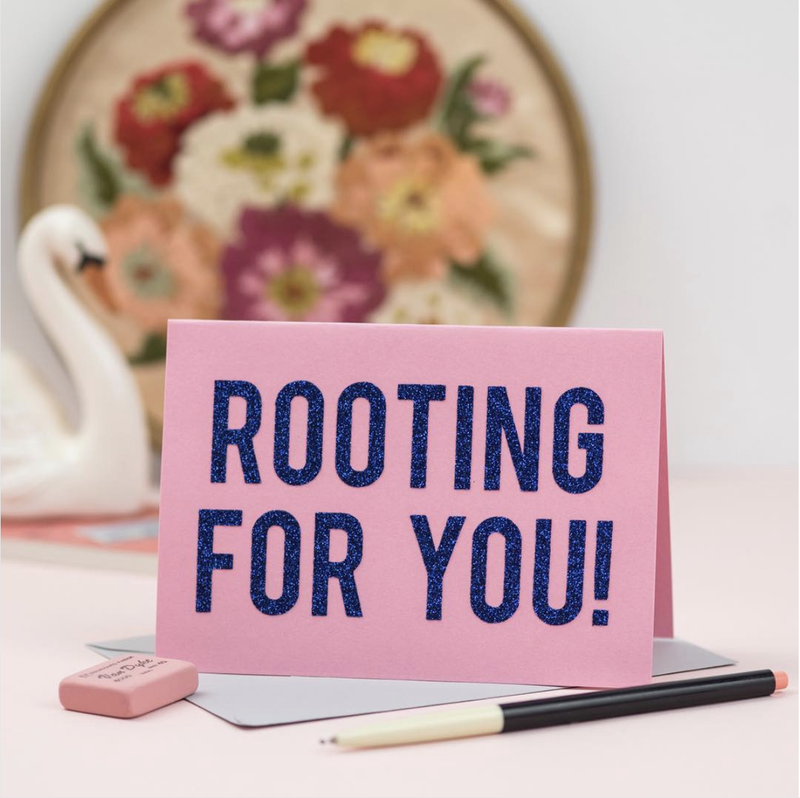 This post from Anna Whitehouse, aka Mother_Pukka, couldn’t be more different from the ones we’ve chosen so far, but it serves to demonstrate that when you’re sharing important ideas you need to make them stand out. Thanks to its bright (on brand) colours and simple, bold text it grabs attention and halts your scrolling in its tracks. TIP: Don’t be afraid to build your grid around bold, attention-grabbing colours and images if that’s what works for your brand. If you’re a stationery lover (let’s face it, who isn’t? ), you’ll love the feed of this stunning stationery and gifts studio in London. We’ve not chosen this post because we love the products though, we wanted to draw your attention to the thought that has gone into the photography. The focal point is on the product and text in this image, but it’s complemented by highlights of this same colour (which also happens to be on brand) coming through in the background: note the eraser on the pencil and the pink within the flowers at the back. This helps to create a more cohesive image brimming with interest. TIP: Shoot in portrait mode or use a wide aperture to create this blurred background effect. When you have a product that’s as eye-catching, not to mention as delicious, as Monty Bojangles it can’t be that hard to create attention-grabbing images for Instagram, right? 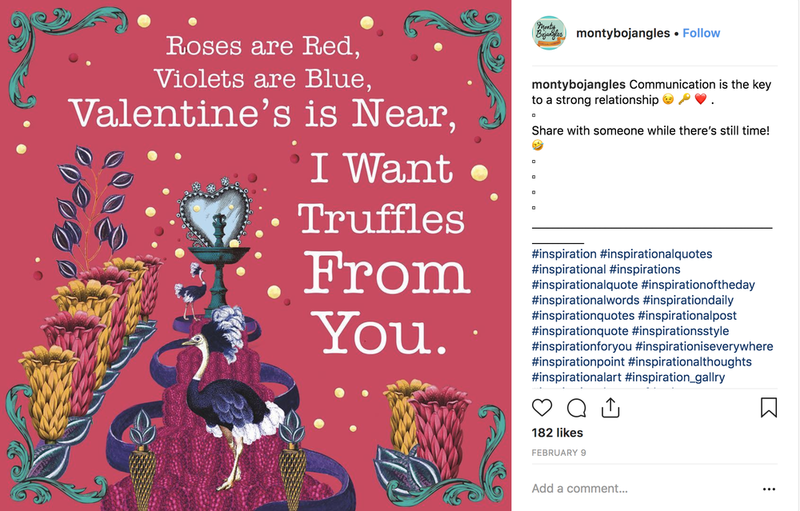 This post, and the truffle makers’ feed in general, is so on brand and unmistakably Monty Bojangles that when one of their images pops up in our feed, cocoa dusted truffles are all we can think of…….Sorry, we drifted off there for a moment….How’s that for keeping your product front of mind? TIP: If you’ve invested in hand drawn illustrations to bring your branding to life, make sure you get value for money by splashing them liberally, and regularly, across your Insta feed a la Monty Bojangles. We talk about that more here: Squeeze every last drop of value out of your design budget. One of the important things to think about when creating Instagram posts is making sure they stand out from the crowd and grab attention. Obviously, we know this is easier said than done. But sometimes it’s possible to disrupt the status quo by creating something that’s just that little bit different. 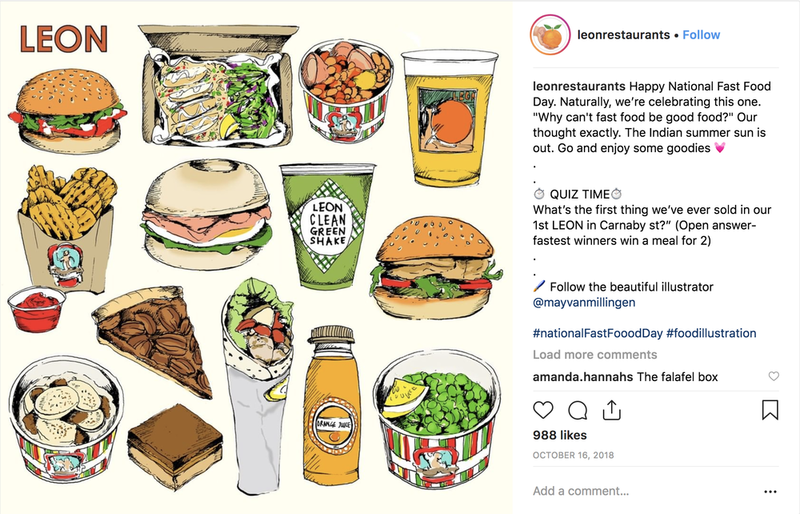 That’s what upmarket fast food restaurant Leon have done by creating this stand out illustration of their most popular products. We love the clean background making the illustrations the focus and the clever inclusion of the logo in the corner to aid brand recognition. TIP: Think outside the box and don’t be afraid to try something different to see what resonates with your audience. BONUS TIP: Preview app lets you upload the pictures you want to share on Instagram and decide which order looks best in your ‘9 squares’ so you can create a perfectly branded grid to be proud of. We hope we’ve given you plenty of Insta-ration to get your journey off to a flying start. *If you need help to get your branding and website looking shipshape and showing you in your best light, we’re always happy to help. Check out some of our recent projects and get in touch if you’d like to find out more.